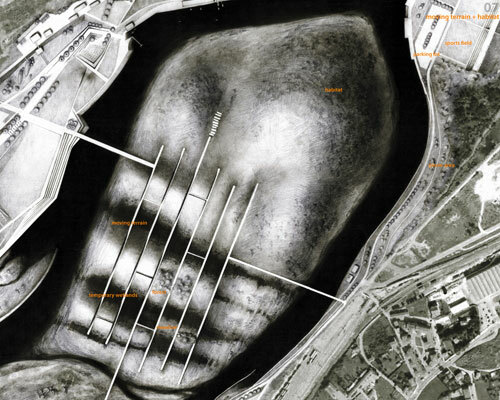 Site Analysis: The background pastel drawing is describing the beauty of the site and the diagram explains the major problem of the site, heavy contamination. 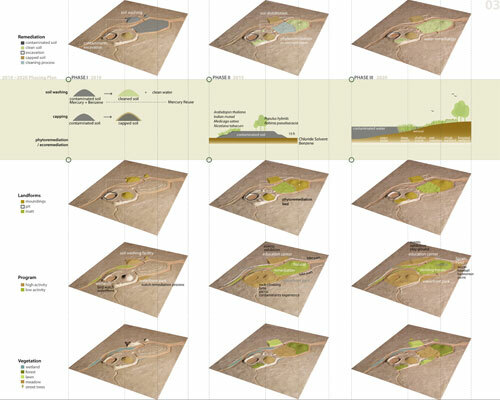 Conceptual Models and Drawing: The models are showing the phases of landforms and the conceptual drawing represents the image of the site design. Phasing plan: Three stage phased plan is showing the remediation, landforms, programs, and vegetation layers in chronological order. Also three remediation strategies such as soil washing, capping, and phytoremediation are explained. 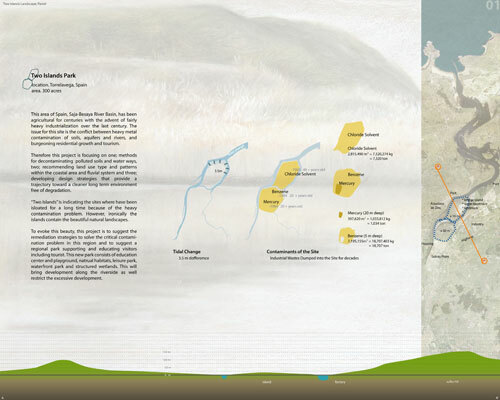 Masterplan: This image shows the project masterplan within geographic context. Masterplan Part 1: Education Center and Playground. Masterplan Part 2: Wetlands. The structure of each wetland is described with diagram. "The drawings are exquisite. An evocative earthworks strategy that creates a memorable, physical place." 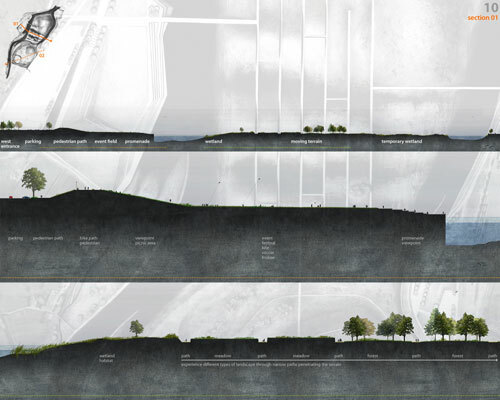 "Two Islands Park" is an evolving park displaying changes in the landscape through artificial and natural methods. 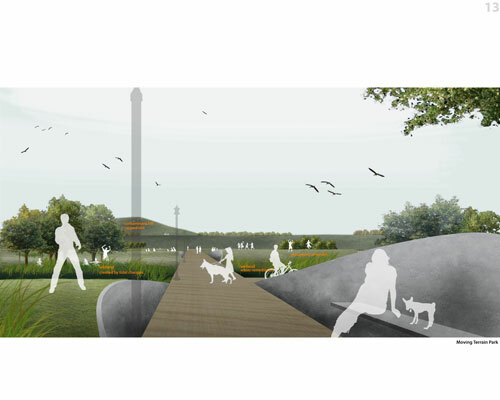 The park aims to educate visitors about contamination, to support the surrounding region's leisure activities, and to revitalize the region by remediating the landscape into a local amenity. The park utilizes remediation strategies as tools to relate the social and ecological aspect of remediation with the local region. 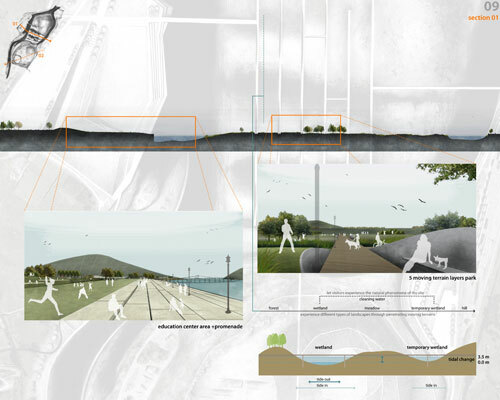 The site of "Two Islands Park" is located in the Saja-Besaya River Basin estuary approximately forty-five minutes away from Bilbao Spain. Historically an agricultural region, the advent of heavy industrialization created severe metal contamination. Today, this contamination conflicts with bourgeoning residential growth and tourism interests. 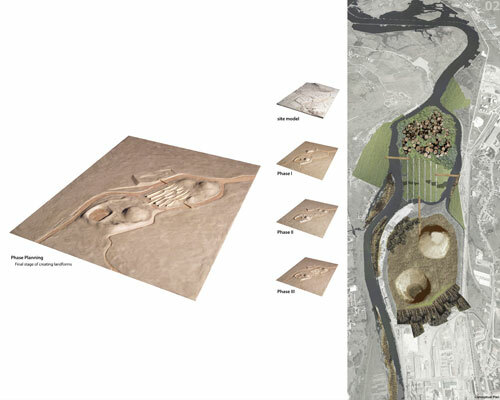 Although conceptually divided into two islands, "Two Islands Park" is a 300 acre site consisting of one island and the surrounding area within the upstream region of the Saja-Besaya River Basin. Current land use is a mixture of agricultural, industrial, residential zones. 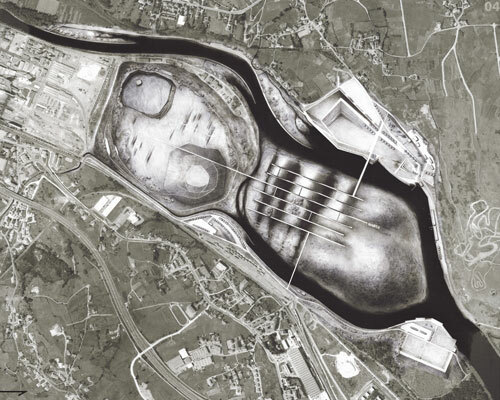 Waste dumping by local industries created the site's major problem of mercury, chloride solvent and benzene contamination within the soil and water. The contamination prevents any exploration of the island's beautiful landscape layers. Asturiana de Zinc, a sulfur dioxide factory located within the site, will suspend industrial production in 2010. With the factory's closure, design strategies are necessary to provide new land use and associated remediation strategies. Remediation strategies are first discussed in order to rehabilitate the land to support new activities and to develop the region's potential to transform into local attraction. The park aims to educate visitors about contamination issues and to provide visitors with amenities and active recreation programs. Vestiges such as artifacts from the remediation process will educate visitors about contamination, while newly introduced land use will illustrate the resulting benefits of decontamination. Providing vital open space for the public draws increased numbers of people to the waterfront and will create the potential for development opportunities that enrich the environment of the local residents. Both the site's land and water require decontamination before public use can occur. Three methods remediate mercury, benzene, and chloride solvent out of the contaminated soil: soil washing, capping, and phytoremediation or ecoremediation. Current research states that only mechanical processes like soil washing are able to remediate mercury. Therefore, the first remediation strategy introduces this technique to extract mercury as well as benzene from the contaminated earth. The Asturiana de Zinc factory building transforms into a soil washing facility after the factory's closure. 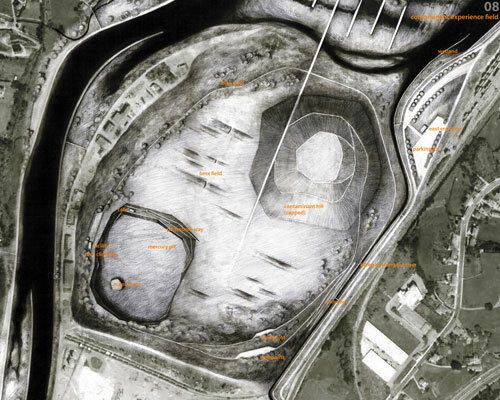 The second remediation strategy for benzene and mercury is to cap the contaminated earth into hills and landforms. The third remediation strategy consists of phytoremediation and ecoremediation. This method will clean chloride solvent from the soil slowly but ecologically in order to settle the soil and create a natural habitat for wildlife. After the soil is remediated, wetland technology also cleans the contaminated river through a slow but ecological process. The phased plan begins in 2010 when the Asturiana de Zinc factory will close. The park's design and programs will develop over three phases of five years each. The components of each phase are determined by the chronological characteristics of the remediation strategies. 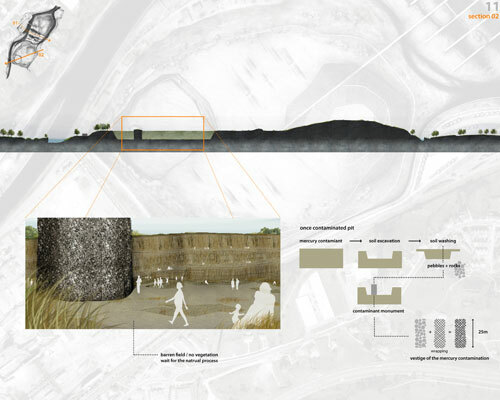 Phase I: The soil washing process relocates the contaminated soil around the site. The majority of contaminated soil will be cleaned thro ugh the soil washing facility while the remaining soil is preserved to create the Contaminant Hill monument in a later phase. Rock blocks create eco-friendly paths along the riverside that firmly structure the wetlands adjacent to the river. 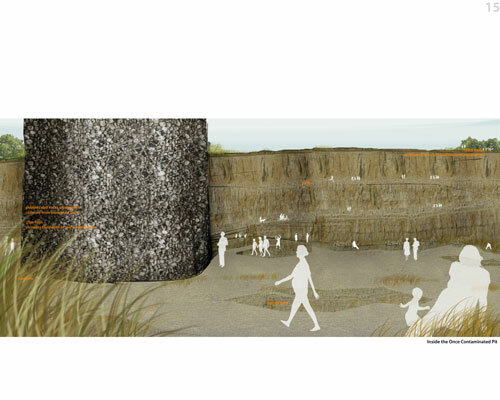 An entrance area on the east side of the site will allow visitors to see and understand the remediation process. Phase II: Cleaned soil is transported from the soil washing facility to the wildlife habitat in northern part of the island. Ecoremediation enriches the soil to create a stable natural system. The southern part of the island will undergo a phytoremediation process that will take approximately five years to clean the area. The soil washing facility is reprogrammed into the education center with a renovated once more with a gallery, visitor's center, and museum. The Mercury Excavation Pit and the Contaminant Hill, vestiges of the contamination, open to the public. Highly active sports such as rock climbing and BMX biking are introduced into the southern part's field. Linear landforms create BMX tracks that symbolize the soil-drops that developed from trucks during the transport process. Bike paths along the riverside and a sports field in the northern part of the site are also constructed within the second phase. Phase III: Phytoremediation forms patterns that provide the basis for the road systems within the island. After the phytoremediation, flat terrains are altered into wavy terrains to augment the presence of tidal changes in the site. Depending on the 3.5m tidal differences, wetlands emerge and disappear within the wavy terrain. This emergence and disappearance, called moving terrains, creates diverse landscapes while naturally cleaning the water. Adjacent areas to the island will support the local residents through active programs that draw people to the waterfront. Thicker strips of green spaces and street trees implemented in this phase will emphasize the pedestrian pathways. Two main entrances, located at the east and west of the site, serve vehicles while the sub-entrance, located below the east main entrance, serves people and bikes. The island's surrounding city context contains more active programs than the island itself such as education of contamination and remediation in museum and gallery, festivals and events, kite flying, frisbee, soccer, baseball, children's playground, picnicing, experiencing the contaminants of the site, rock climbing, and BMX biking. These programs will occur within an education center, children's playground, play lawn, promenade, contaminants experience field, and athletics field. This surrounding area provides an active waterfront park typically found in major cities. In the island, the Moving Terrain Park serves as a transition area between the active parks area in the southern section and the wildlife habitat in the northern section. The Moving Terrain Park allows for walking and playing on the meadows and wetlands while physical access to the wildlife habitat is prohibited. Section 01: This shows the section cut through the Moving Terrain from the west entrance to the east entrance. 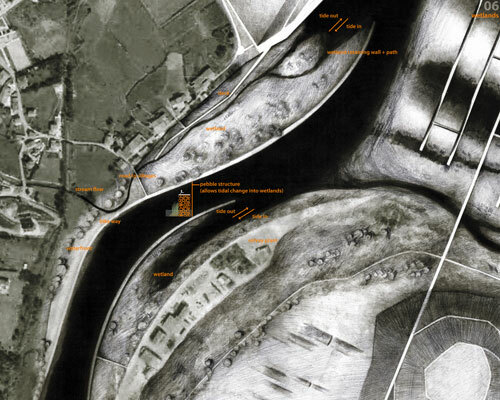 Perspective images with diagrams are explaining the waterfront and the concept of the moving terrain. Section 01: Two parts of the section is enlarged to show the detail programs and spatial structure of this part. Section 02: This is the section cut through the Contaminant Experience Field from the pit to the hill. Especially the structure of the monument inside the pit is explained. 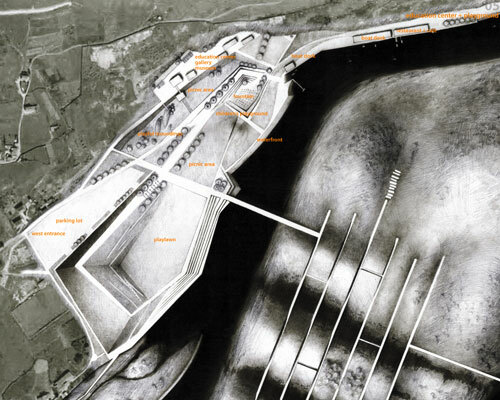 Section 02: Two parts of the section is enlarged to show the detail programs and spatial structure of this area. Moving Terrain Park: The perspective drawing is representing the change of landforms with diverse landscapes. 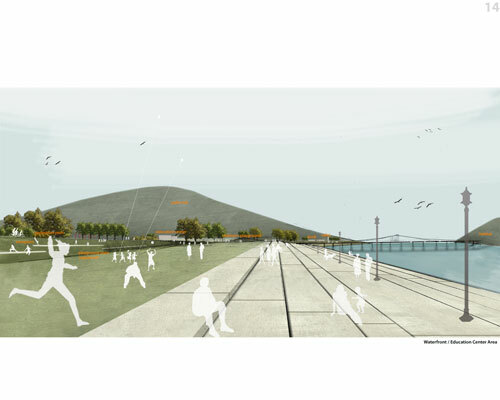 Waterfront / Education Center Area: This drawing is showing the wide open space along the riverside which is full of diverse activities. 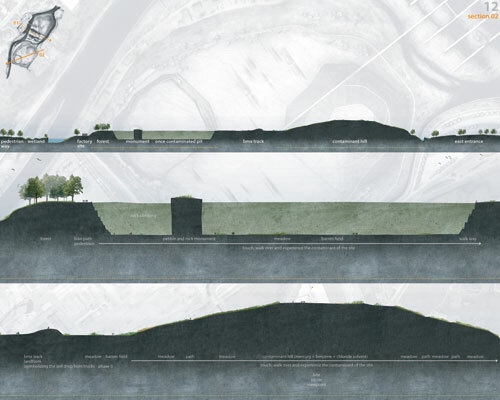 Inside the Once Contaminated Pit: This drawing is showing the vestige of the soil excavation and the contaminant monument.